Selamectin is a broad-spectrum antiparasitic active ingredient used in veterinary medicine in dogs and cats against external parasites (lice, mites, fleas, etc.) as well as against internal parasites (e.g. roundworms). It is not used against agricultural and household pests. It belongs to the chemical class of the macrocyclic lactones. The table below indicates some usual dosing recommendations for selamectin issued by manufacturers or documented in the scientific literature. They may not be approved in some countries. Selamectin is a macrocyclic lactone with a broad spectrum of activity that is used only in spot-ons for dogs and cats. It is effective against gastrointestinal roundworms and also against a number of external parasites such as fleas, lice, mites and a few tick species. However, it is ineffective against tapeworms and flukes. Warning! : Tolerance and safety margin in dogs with the MDR-1 mutation (e.g. Collies) sensitive to ivermectin are higher for selamectin than for ivermectin. Consequently the recommended dose can be admnistered to dogs with de MDR-1 mutation. Such dogs treated at 5x the recommended selamectin dose didn't show adverse reactions. Learn more about selamectin safety. WARNING: It is obvious that veterinary products are not intended for and should never be used on humans!!! In pets: Yes, reported to ivermectin in heartworm microfilariae in the USA (so far particularly in the South), with cross-resistance to macrocyclic lactones, most likely including also selamectin. 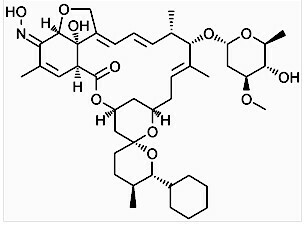 Selamectin is a semi-synthetic macrocyclic lactones obtained from fermentation extracts of the soil microorganism Streptomyces avermitilis. Selamectin is the pet endectocide from ZOETIS (formerly PFIZER ANIMAL HEALTH), which has another endectocide specific for livestock, doramectin. In fact, selamectin is a derivative of doramectin. Selamectin is a special case among the macrocyclic lactone. At the therapeutic dose it is the only one that is effective against fleas and provides a certain control of a few pet ticks as well (Rhipicephalus sanguineus, Dermacentor spp), but not of other tick species (e.g. Amblyomma spp, Ixodes spp, etc.) important for dogs. Otherwise selamectin is an effective heartworm (Dirofilaria spp) preventative and controls a few other pet roundworms as well (e.g. Toxocara canis, Ancylostoma spp) It also controls a few mite and lice species. However, selamectin is ineffective against tapeworms, flukes, mosquitoes and any flies. In dogs, after topical spot-on administration selamectin spreads rapidly through the dogs hair-coat within the first 24 hours. Only a small part of the administered dose is absorbed through the skin into the bloodstream. Highest blood levels are achieved about 70 hours after administration. In cats the amount absorbed into blood is significantly higher, probably due to the thinner cat skin and to oral intake after grooming. As a consequence, bioavailability is much higher in cats (~75%) than in dogs (~5%). Excretion runs faster in dogs than in cats. In both dogs and cats, most selamectin is excreted through feces and only a small amount through urine, mostly in the form of the parent molecule. As all macrocyclic lactones selamectin acts as agonist of the GABA (gamma-aminobutyric acid) neurotransmitter in nerve cells and also binds to glutamate-gated chloride channels in nerve and muscle cells of invertebrates. In both cases it blocks the transmission of neuronal signals of the parasites, which are either paralyzed and expelled out of the body, or they starve. It also affects the reproduction of some parasites by diminishing oviposition or inducing an abnormal oogenesis.